What is meant by PACE? Is DDP right for your family? Holding a book in your hand for the first time is always a special moment. Years of work, and then a gestation period whilst it goes through the publishing process. When the finished product arrives it is a moment of pride and accomplishment. 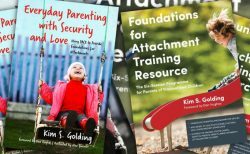 I have had this experience twice this year, first when my Foundation for Attachment Training Resource arrived and then with the publication of the accompanying book – Everyday Parenting with Security and Love. I have especially enjoyed writing these. It built upon some training I was delivering which explored the challenges of parenting children with developmental traumas and how the DDP model can inform the therapeutic parenting of these children. It gave me an opportunity to really develop my thinking about the attitude of PACE and the other DDP principles and how to help parents bring these into their parenting. Over time this developed into a six session or three-day programme which complements the Nurturing Attachments programme. I have followed the same model as for the Nurturing Attachments programme with a training resource for practitioners providing all the material to run a group work programme, and the book which provides more depth to the exploration of the content written in an accessible way for parents and practitioners to read. This is illustrated with stories of fictional families drawn from my experience of the many families I have been privileged to work with over the years. Oh, and some cool drawings provided by my son Alex. 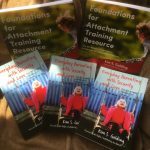 In developing these materials, I have been fortunate to be supported by some great people and services happy to pilot the Foundations for Attachments groups, and this has further informed the development of the programme. The results of this pilot work are written up within the training resource. This early feedback has given me confidence that the resource and book will be helpful additions to provide much needed support to the range of parents and carers parenting children with developmental traumas. For anyone interested in previewing these books I will be launching them as part of our DDP conference this September which will also be launching our brand new Community Interest Company, ‘DDP Connects UK’. More news about this can be found on the event page. A Growing DDP Community in Canada’s Capital! Read more on DDP USA & Canada: A Growing DDP Community in Canada’s Capital! DDP Network is a worldwide body that promotes Dyadic Developmental Psychotherapy (DDP). We provide information about the therapy, how to become certified in DDP, the parenting approach, resources, training courses and conferences.